Hiko Seijuro writes an analysis of the sweeper-keeper (False 1 anybody?) role. Football is a holistic game, increased offensive responsibilities for one player means increased defensive responsibilities for another player; you move one step forward in one place and you have to balance the movement elsewhere, “here a little, there a little” all in the bid to get a decisive advantage over your opponent. 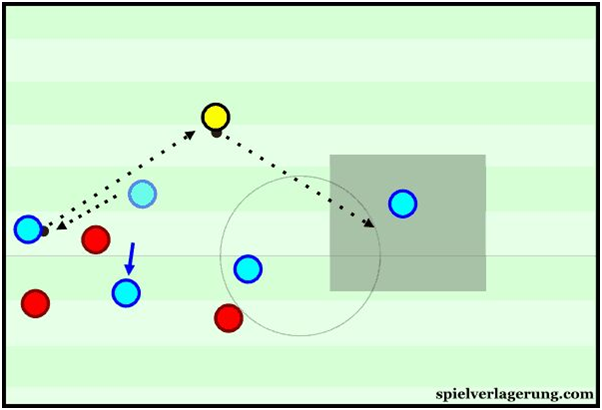 This is the thinking that has ensured the increased popularity of the tactical trend of the sweeper keeper which although not a new tactical innovation in a strict sense has become more popular in no small part to the successes achieved by elite managers like Pep Guardiola, Joachim Low, Mauricio Pochettino and Luis Enrique while using this tactic. Pep even raised a few eyebrows when he immediately asked for City to sign Marc Andre Ter Stergen from Barcelona, Barcelona refused to sell and Pep was forced to make do with Claudio Bravo who many are of the opinion is an inferior goalie (with his hands) to the axed Englishman. But with all this talk about sweeper keepers and what not, it is not completely clear exactly which kind of goal keeper can be branded a “sweeper keeper” and what advantages or disadvantages they could bring to the team and that is what this piece seeks to address. A football team is made up of eleven players , ten of which are outfield players and the last one – the only one allowed to use his hands is the goal keeper who as his name implies has the job of the last line of the defense, stopping goals with his hands. For the vast majority of football teams, the value of a goalkeeper is judged mainly by how good he is with his hands; however, there is a small minority of teams that emphasise that a goalkeeper must be good with his feet as well as his hands in order for them to be assets even when the team is in possession – this is the concept of the eleventh man. A goalkeeper whose relevance to his team is not diminished regardless of who has the ball. 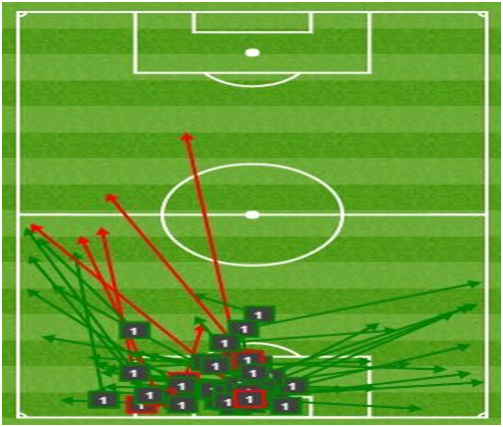 This role was performed brilliantly by Ter Stergen in Barcelona’s 1:0 victory over Athletic Bilbao at San Mames earlier this season, the Barcelona keeper broke the Laliga record for pass involvement by a goalkeeper, enabling Barcelona to regularly bypass Bilbao’s high press and find space for their front three to attack. 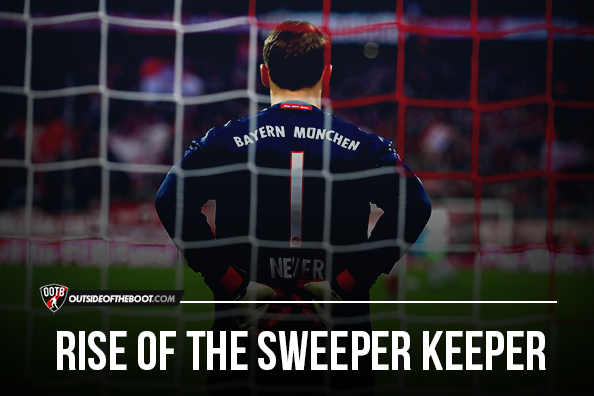 Who is a sweeper keeper? In simple terms, a sweeper keeper is a goalkeeper who controls the space behind the defensive line by pushing up and staying as close to it as possible and actively participating in his team’s play when they have the ball thereby operating as an eleventh outfield player. From this definition, we can at once pinpoint a number of goalkeepers who would qualify to be called “sweeper keepers”. Modern football is all about space management and control and having your goal keeper push up behind your defence, enables the team to effectively control that space. The sweeper keeper as a football tactic has been around as far back as the late 1800’S and unlike many other tactical innovations actually started in England. The first sweeper keeper was former Stoke City and Sunderland goalkeeper Lee Richmond Roose; he generally took advantage of the FA’s rule which at that time allowed the goalkeeper to handle the ball inside his own half without carrying it; Roose would bounce the ball up to the half way line before launching attacks. Roose performed this role for six teams from 1895 to 1912 and his retirement coincided with the change in the FA’s rule which then limited handling by the goalkeeper to within his own penalty for area and is rightly regarded as the progenitor of the sweeper keeper role. The role of the sweeper keeper like every other aspect of football has been shaped by rules and in 1925 when the two player offside rule was introduced, it made the space between the last defender, the last attacking player on his shoulder and the goalkeeper a contested area; pushing up allowed the defenders to force offside which meant holding a high defensive line; this in turn exposed the team to through balls and balls over the top – the same threats faced by teams that hold a high defensive line, and it was therefore incumbent on the keeper to have the awareness and control that space especially if the defender was slow. After Roose retired from top flight football, Lev Yashin and Gyula Grosics were the next in line to carry the torch; they were both noted for their ability to leave the comfort zone of the penalty area and play the ball with their feet. In fact, Yashin often launched counter attacks with his long throws out to the attacking players, a trait currently possessed by Manuel Neuer. The father of total football Johan Cryuff put great emphasis on the technical abilities of every member of his team including the goal keeper. His philosophy which has greatly influenced his heir Pep Guardiola is all about mastery of space and being able to break through successive lines of opposition pressure to score; it is in this regard that a keeper acting as the eleventh outfield player becomes important. In football, 80% of the game is spent either trying to progress the ball through successive zones or trying to stop the ball from being progressed cleanly, this is the basis of attacking and defending, and that is why teams will usually instruct their furthest forward player to do whatever he can to restrict the opposition’s build up. It is in the first phase build up that the greatest danger lies for the team in possession because if they lose the ball there, the opposition has a shorter path to goal and can attack them directly. However, when the opposition presses with the same number of attackers as the team in possession has defenders to build up with the goal keeper becomes a vital means of creating an initial overload necessary for a clean progression. Pep Guardiola has used this principle to devastating effect during his relatively short coaching career in which He has won 22 trophies in just 8 years. The first person to play this role for him was current Middlesbrough goal keeper Victor Valdes and all through his career he has shown a liking for keepers who do more than just keep. 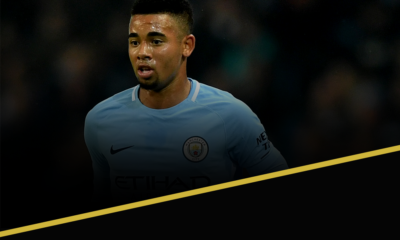 This season after the first Manchester derby which he won 2:1 after a dominant first half display, while the vast majority of football pundits and fans were poring over Bravo’s errors which allowed Manchester United to get back in the game, Pep was full of praise for his goal keeper’s performance. What he meant was that because Bravo provided an extra ball playing option to overload United’s first line this stability in build up allowed them to dominate other phases of the game as they progressed forward. This showed in the fact that in the game in question, Pogba and Fellaini were the only opposition players to complete more passes than the City goal keeper and despite the fact that Bravo hasn’t been inspiring with his hands, Pep has stuck with him in goal. Bravo providing an option to overload United’s first line of pressure and play out of the back. One of the tenets of Cryuff’s style was to compress the pitch and make it as small as possible when the opposition has the ball by pressing them high up the pitch. 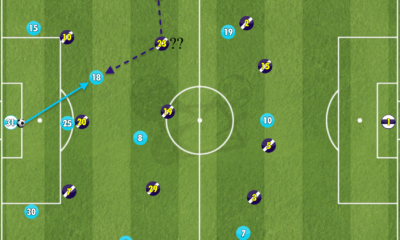 If such pressure is to be successful, then it must be followed by successive lines of pressure which requires the midfield to push up and support the forwards and the defense to push up and support the midfield. As earlier stated, this allows the team to force offsides and regain possession but also exposes them to well-timed balls over the top and through balls. The team therefore depends on the goal keeper to push up and support the press by controlling the space behind the defense thereby reducing their susceptibility to such balls. Among other qualities, a sweeper keeper must have awareness, positional intelligence, speed, and good technical abilities, He must be able to read the game almost like an outfield player and intercept balls before opposition forwards can latch on to them. Like every other tactic in football, using a sweeper keeper is neither good nor bad, whether or not it is advantageous to the team depends on how it is executed by the player and how the rest of the team reacts to it. Firstly, asking the goal keeper to position himself so far away from his box removes the one decisive advantage that the goal keeper has over other players – the ability to use his hands. This means that the goal keeper is at a potential disadvantage if he gets into a foot race with a forward for a through ball. Thus, if the goal keeper doesn’t time his sweeping properly, he’ll expose an unguarded goal to the opposition. Also, in order to be in a position to sweep up behind the defense, the goal keeper’s starting position must be relatively high up the pitch and this exposes the goal to long range shots from inside the opposition’s half which was how Charlie Adam scored his wonder goal against Chelsea last season. The sweeper keeper tactic is a high risk tactic, the element of risk presents itself in the potential consequences of a poor execution; if the last outfield player makes a mistake that presents possession to the opposition’s forward, He can hope that his keeper will bail him out, if on the other hand, the goal keeper is the last person that makes such a mistake, he can only pray. This was cruelly evident in City’s group stage game against Barcelona at the Camp Nou where all their good work was undone by a single mistake by Bravo who passed the ball straight to Suarez while trying to be a sweeper keeper, Suarez chipped the ball and Bravo compounded his error by handling it outside the box, He was red carded and City went on to lose 4:0. Using a sweeper keeper like every other tactic is neutral, it depends on the team, the personnel, and how the coach desires for his team to play. It is a high risk tactic used by teams that desire total control and are willing to take risks to achieve it. When done properly, it can have a wide range of positive effects on a team’s overall attacking play such as increased stability and penetration; however, not every team can use it and when executed poorly, the consequences are usually immediate and lethal. The onus is therefore on the team to find the right balance in order to achieve the most success.